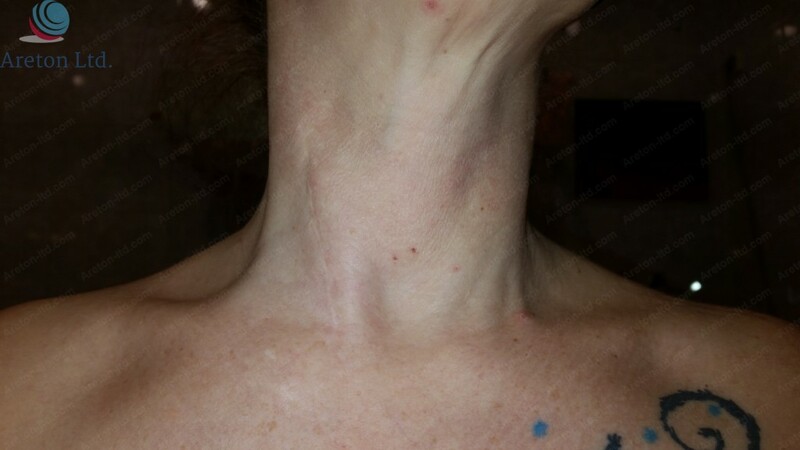 As seen in middle of the picture, 14 days after the procedure, the area is slightly red and it has a different texture. The treated area blended well 10 weeks after the treatment. The following video will show you the procedure, before, the healing up until 10 weeks after the procedure. The video will provide you with an overview of the entire case study and will emphasize the important points you can learn from this experience. The numbing product used, was topical anaesthetic (10% lidocaine) applied with occlusion for one hour. Remember, the active ingredients contained in the topical numbing porducts available "over the counter" in Europe, can fary vary. In the specific country 10% lidocaine formulation was available "over the counter". In most European countries the formulation available without a prescription range between 2.5% and 5% lidocaine. Although the particular numbing product was applied for a relative long time (one hour) to achieve the desired numbing effect, this does not mean that the only fast numbing alternative is injectable local anaesthetic. In fact, in most cases, there is no need to use injectable local anaesthetics for this types of procedures in order to achieve a fast numbing action of the area. In Europe, medical practitioners can use strong topical anaesthetic formulations which achieve the complete numbing of the area in 5 to 10 minutes, sometimes even without the use of occlusion. As seen the skin is slightly pinker soon after the scabs has fallen off (during the long-term healing). This is a normal reaction after mole removal of any other minor skin wounds. The area will eventually blend with the surrounding skin, leading to seamless results in most cases. Always bear in mind that the area doe not always blend perfectly with the surrounding skin. Sometimes a minor permanent scars may result, despite the way the treatment was carried out. 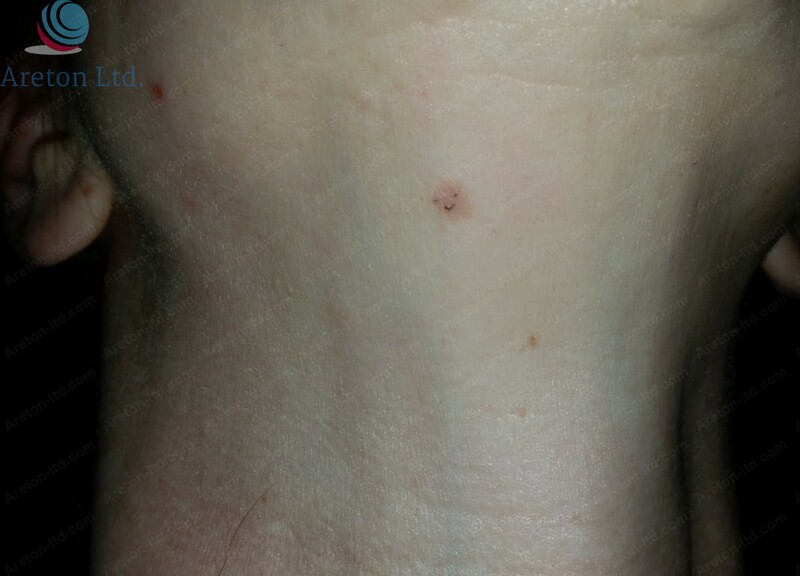 In this case like in most others, 10 weeks after the treatment the result was almost seemless meaning that it was difficult to tell where the mole was previously located. This picture shows where the mole was previously located. Below you can appreciate a number of before pictures taken right before performing the plasma removal procedure. The mole was not subject to any change over time, this also confirmed that the lesion was benign. This picture shows the healing still in progress a few days after the plasma mole removal treatment. The arrows indicate where the plasma treatment was carried out. The mole in question in this case study is in the uppermost part of the picture and it is hardly visible due to the way this particular picture was taken at the time. However this picture shows how the treated area looks before the scabbing takes place. Picture without the arrow indicators. Area 10 Days After the Procedure. The new skin is pinker and has a different texture to the surrounding skin. The area will eventually blend with the surrounding skin leading to seamless results. 14 Days after the procedure no major change occurred as the area is now subject to long-term healing. The area will change over time but the process will be rather slow. Area 10 weeks after the procedure. The location of the previous mole is hardly visible. In this case it is very likely the results will be complete seamless after a few more weeks. In the following gallery you will see the most important pictures of this case study.